Is OLM the only non UHI station around. It would be nice to be able to compare the regional warmth elsewhere to somewhere other than that One station year after year. Definitely agree. You can also tell it’s UHI because the difference between SEA/OLM is higher when it’s calmer and much less when it’s breezy. At least that’s what I’ve been noticing since I started keeping track. I think they just copy/pasted from the CFS/climate models or something. No way they did thorough analoging because a solution like that was never on the table for June. I get the feeling that they do that all the time. So you think intraseasonal forcing just shuts off in favor of a warm background state, then abruptly reverses to a cold background state in September? I’m not sure how that’s even possible given the slow walk to Pacific forcing/warm-neutral ENSO. FWIW, I’d be shocked if autumn starts early this year. It looks like a torch to me. At least from mid-September to mid-November. Almost the opposite of last year, which was ridgy from August to mid-September, then flipped. I could see the inverse of that happening this year, though perhaps overlap with early-August heat. No, it's going to be a gradual progression back into warmer/hotter weather. The reason we're seeing a slight break from hot weather is because of the heat event we had in June. We just can't continue to torch all summer long, there will be some slight breaks along the way. The models are now showing the heat returning during the 2nd week of July. In order for my July PNW forecast to verify, I'm going to need the big time heat to come during the 2nd half of July. The pattern looks like it will be there for it to happen, just have to wait and see now. Summer started early this year so why can't fall start early as well? Fall officially starts on Sep 22. I'm thinking it comes a weeks or 2 earlier this year. After you clean your room, Messy Mark! Isn't that what you have been predicting? I know about the book. I even read it to some 3rd graders during my fake teaching days! I saw the warm-up and factored it in. The problem is a cumulative UHI influence adding ~ 2 degrees to both locations. OLM is right at average. And I had them at -0.25. So pretty much on target. I figured (incorrectly) that SEA’s UHI was about 0.5*F. But it’s more like 2*F. Oops. I also factored it in but more so due to the fact our climate has gradually warmed a little over the past several decades. I really thought we were going to have a solid 2 week period of below average weather but early on that idea was squashed immediately. Then the heat event during the 2nd half was something I did not see coming. I thought it would hold off until early July but it came sooner than I expected. I had OLM at -0.2 and it looks like it finished at +0.1. If not for the heat event in June, then we would of probably been right on the money and OLM would have had a negative departure. Fake news, fake teachers and ENSO head fakes! Bolded = complete malarkey. IMHO. Where is the logic in that? How do warm/cool summers ever happen, then? I’m not saying your forecast is necessarily wrong, but I’m having trouble understanding your reasoning. 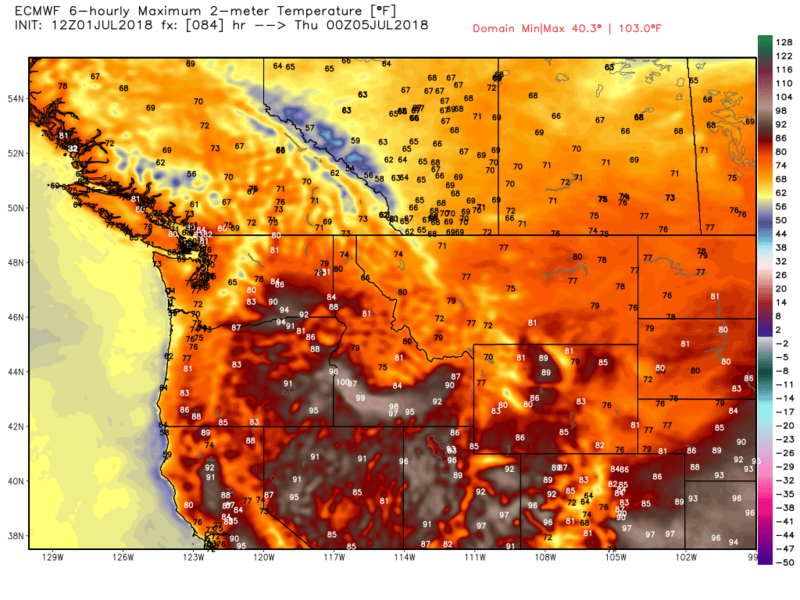 My guess is the hottest temperatures of the summer in the PNW/BC will occur during the third week of July, and that July will be only “hot” month of the summer, though September might give it a run for its money. It also wouldn’t shock me if August is cooler than June by a significant margin, relative to average. It also wouldn’t shock me if August is cooler than June by a significant margin. Relative to average or in terms of raw temps? The latter would be completely unheard of. Caught me before the edit. Yeah, relative to average is what I meant. I really hope it finally stays dry today. Would be nice to mow my soggy grass. The heat is gonna follow me out there. I guarantee it. Peak of summer in the PNW: 7/18 to 8/6. If you have outdoor festivities planned, plan them for that window. Going out on a pretty huge limb with that. 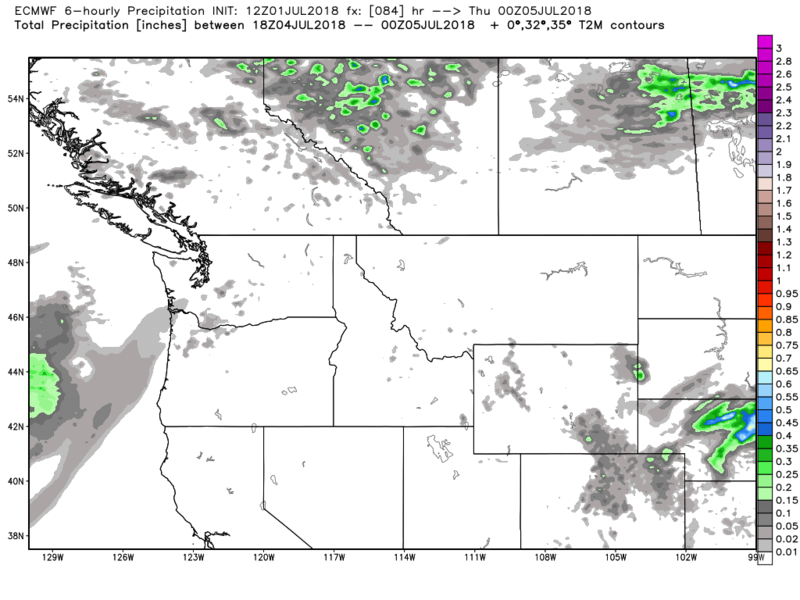 Before you get TOO carried away with your weather omnipotence, that is about as no-brainered as you can get for a PNW hottest three weeks of the year. Couple that with the fact the last two summers skipped over this period and yeah, you're screwed. Our 50-55 degree dew points will bring you to your knees. Avoid rest areas! Last summer didn't really skip over it. Unless you call 105 degrees "skipping". I’m starting to get insight into why the Dewyism due-ism system works the way it does. For some reason I thought that s**t started closer to mid month. You'll be erecting a four-legged shrine to it this August. Drop the cynicism and let yourself be excited! The real sad part is people get paid bucks to put those TWC forecasts out. You're really going out on limb with that forecast! Climatology speaking this is always true for the PNW. Lol you guys. I meant relative to average. Which factors in climatology. Even I’m not that sleazy. If I forgot about significant warmth more often I would find myself thinking we were always due for more warmth too. And thanks to a warming climate I would be right regardless! I see a cloud! Quick, take shelter and stay away from any objects that are colder than your average temperature! All of last August was pretty much a single hot blur to me. 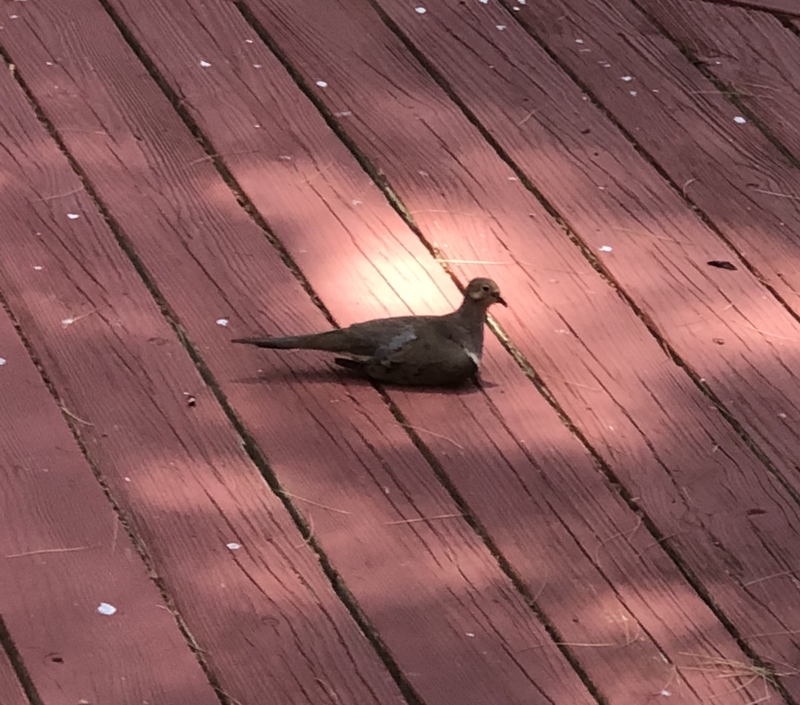 The birds are like f**k this s**t. Been sitting like this for hours at a time. (In case you’re wondering what those white splotches are). Pretty much the whole 7/29-9/7 period. A smoky, nasty blur. I had a lot of time off around then too, and it really put a damper on outdoor activity. Lots of camping under brown skies. I thought it rained a tiny but on the 8th last year. Or maybe that was 2 years ago? Maybe schedule another trip to Charleston? And JJA wasn’t cool in 2016. JAS was cool, but only outside those stupid UHI bubbles. JAS 2016 easily above normal at both OLM and EUG, known UHI refuges. Yeah, the irony is that all that supremely dry, sunny niceness can actually lead to some supreme smoky gloominess like we had when it gets too bad. Negative feedback loop! It's been warmer than normal 3 of the past 4 July 4ths at SEA, with no rain on any of them and the warmest on record in 2015. Bozeman ended up with a -2F departure for June. Massive bust. +5 for Denver. Accurate here! Meh, OLM was +0.8, PDX was +0.4. And most of WA/OR along/east of the Cascades was cooler than normal, as was the 850mb temp anomaly. So I wouldn’t call that “easily above normal”. More like a hair above normal. It really just came down to those two fluky, typhoon-influenced weeks in August. Maybe a little super niño hangover thrown into the mix. The dominant pattern was still one of troughing. And EUG is most certainly not a UHI refuge. 12Z ECMWF is much cooler for the 4th... and there are more signs of convection as well. Actually inching back towards the GFS solution yesterday morning. Facts like that have no place here! Meh, OLM was +0.8, PDX was +0.4. And most of WA/OR along/east of the Cascades was cooler than normal, as was the 850mb temp anomaly. So I wouldn’t call that “easily above normal”. It really just came down to those two fluky, typhoon-influenced weeks in August. Maybe a little super niño hangover thrown into the mix. The dominant pattern was still one of troughing. +.8 over a 3 month period is easily above normal. And blame it on those two "fluky" two weeks all you want, but that's how anomalies work. Warmer than normal over a certain period doesn't mean every day is warmer than normal. You think EUG is influenced by UHI like PDX and SEA? I haven't seen any evidence of that. It's a small airport outside of the city, like OLM. A little tongue in cheek there from me... and the 12Z ECMWF says its a moot point anyways. It won't get to 80 at SEA. If you average 2013, 2014, 2016, and 2017... you get a perfectly average temperature for the 4th of July. Its not like its been 5 years of ridiculous 4th of July heat. 2015 was the only year that was hot. I presented facts as well. Do the math... average 2013, 2014, 2016, and 2017 at SEA for the 4th of July and tell me the answer. Fact is that those 4 years averaged perfectly normal at SEA. 2015 was off on its own. EUG is one of the least UHI affected stations in the I-5 corridor. It’s actually an unusually cold spot if anything. See December 2013. Not everything has to be silly hyperbole. The 4ths there lately have been mostly pleasant, dry, and summery. Nobody said there's been 5 years of ridiculous heat. Very unlikely to bring you any rain... and the warmth is back again on Thursday. Its really just a mid-level deck of clouds rotating through. Its been giving the models fits. The timing of this cloud band will determine the actual highs on Wednesday. Feels like mother nature is intentionally holding back the ridging, likely waiting for my arrival. No doubt she’s armed armed and ready, though. The potential for a heatwave is legit this month. The last two weeks of the month will have warm pool forcing timed perfectly with the dissipation of the interfering CCKW. Shouldn’t be a prolonged affair or background state, but a heat spike is certainly doable. Phil actually did in reference to the 4th. High was 69 in 2016... hot! It's still showing 75. That's not too bad. This yo yo back and for is stressful. Guess we'll just have to get up on the 4th and see what happens. It’s a pretty coolish run overall. I’ll double check, but I’m pretty sure that’s within a measly 0.5 standard deviations of normal on the 1981-2010 bell curve. Maybe less @ PDX. I did the calculations a year or so ago..will dig them up. There’s been lots of development in the surrounding vicinity, though. Sort of like what’s happening around IAD here. The temperature trend @ EUG is much higher than most surrounding stations that were already urbanized. Again, I bookmarked this info somewhere so I’ll find it and get back to you.